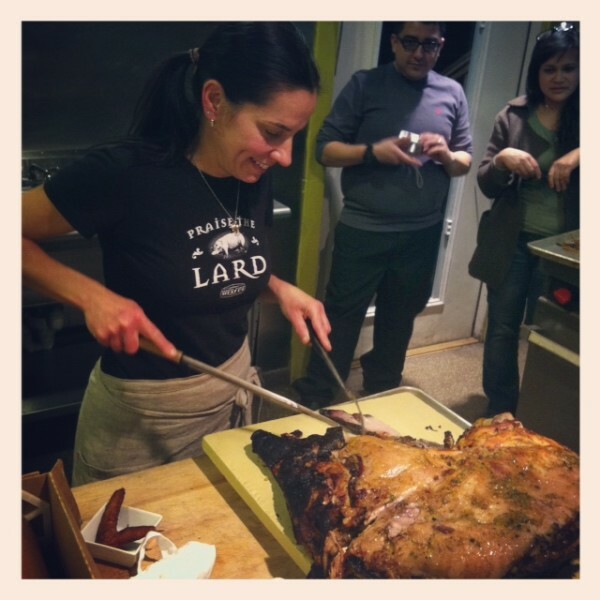 Chef Melissa Kelly of Primo hard at work at a previous Pig Day event. During this year's Pig Day, 180 people processed 15 pigs that had been raised on the restaurant's farm. Malcolm Bedell of 'Wich, Please works during the mid-November "Pig Parts & Roots" dinner at The Landings restaurant. 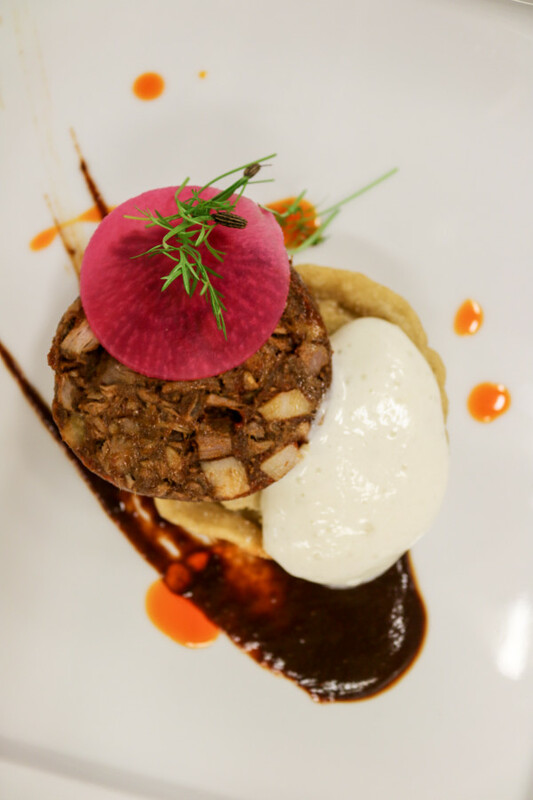 One of the featured dishes in the "Pig Parts & Roots" dinner held in mid-November at the Landings Restaurant in Rockland was this head cheese "McRib" sopecito, made with ancho guajillo barbecue sauce, queso fresco mousse, pickled turnips and fennel microgreens. ROCKLAND, Maine — For midcoast foodies, one of the hottest tickets in town is an invitation to the annual Pig Day extravaganza in early November at the restaurant Primo. While attendees certainly get to eat delicious things, they spend most of the day hard at work processing the just-slaughtered pigs that are raised on the Primo farm. This year, 180 people processed 4,200 pounds of pork, pounding pig legs into prosciutto, making pates and otherwise participating in the day that Primo front-of-the-house manager Justin Roig described as the culmination of Chef Melissa Kelly’s entire belief system. Primo’s Pig Day has been a focal point of the restaurant since 2009. It ushers in several weeks of a special nose-to-tail seven course tasting menu that features products made from the restaurant’s pigs in every course, including dessert. And while such exotic delicacies as pig’s ears, pig’s tails, trotters and head cheese — a terrine made with flesh from the head of a pig — may not be on the typical American menu, interest in nose-to-tail dining has been on the rise in recent years in Maine and beyond. “I think nose-to-tail dinners have caught on in such a big way for a few reasons,” Malcolm Bedell of ‘Wich, Please, a Rockland eatery, said this week. He and Max Miller, chef of The Landings in Rockland, put on a “Pig Parts & Roots” dinner together last week at the restaurant, with 22 diners trying specialities such as the “head cheese ‘McRib’ Sopecito.” This dish featured a slice of house-made head cheese, a queso fresco mousse, pickled turnip and fennel microgreens. 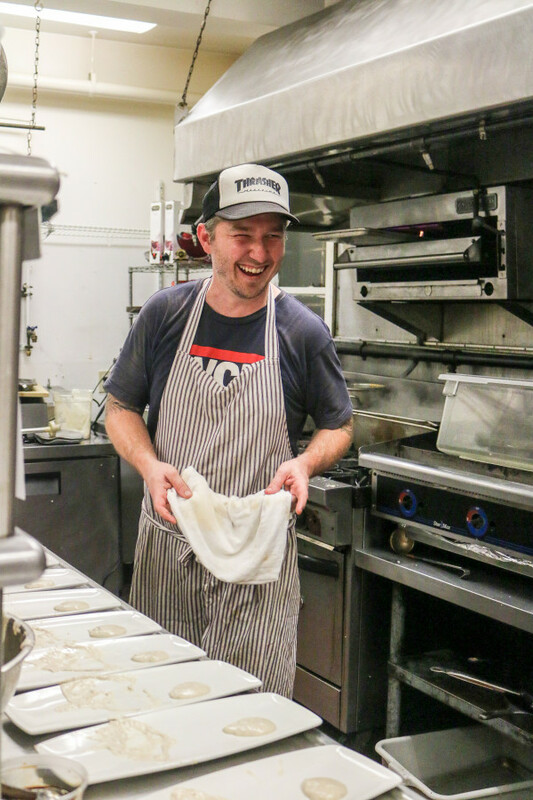 Another reason the nose-to-tail philosophy is catching on is the desire to connect to traditional local practices, some of which had nearly disappeared, according to Andy Lindberg, a Portland-based butcher, chef and food workshop teacher. In October, he helped teach a three-day nose-to-tail processing workshop at the Maine Organic Farmers and Gardeners Association headquarters in Unity, an event that sells out every year. Bedell and Lindberg said people seem to be more adventurous in their cooking and eating nowadays, which also can lead them to nose-to-tail dining.